But there is another attack being conducted now that the court has ruled. It is an attack on our ability as a nation to have godly offspring. In the book of Malachi, God is telling Israel that they have violated the covenant of marriage. And in this part of scripture God spells out why He instituted marriage in the first place. He instituted marriage so that He could find godly offspring. 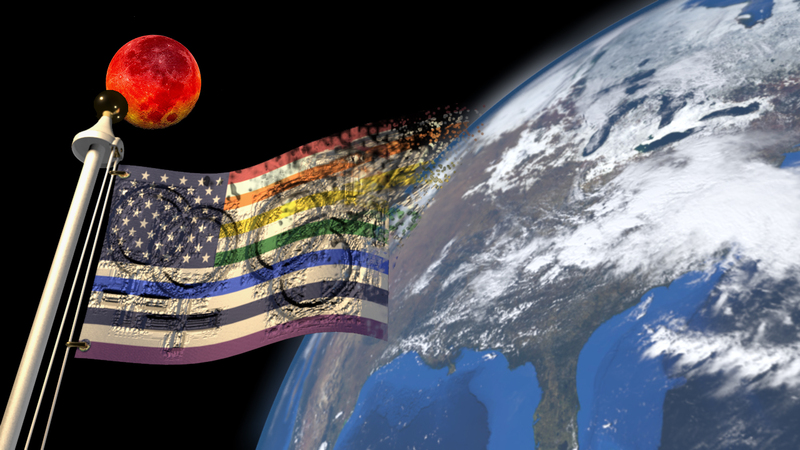 The United States Government has made it it’s mission to destroy marriage. We encourage out-of-wedlock child births with our welfare. We promote promiscuity with convenient abortions by which we hide our sin by committing murder. We have a high divorce rate in our country and more and more young people are living together before they get married… if they get married. Many children do not have a father at home. Now the United States Government has endorsed the attack on the last frail and crumbling beacon of hope to having godly offspring, the definition of marriage. I can see nothing from our government that promotes righteousness. We are truly calling good evil and evil good. I have, like you, been hit with a barrage of corporations following the lead of the rainbow White House. I have now become aware of professing Christians showing support for the redefinition of marriage by putting rainbows on their media pages. This is all done in the name of anti-hate, love and acceptance. A church I used to attend by Seattle as a Bible student is now openly embracing homosexuality by stating there is no hatred here. Many say we must love and embrace and accept the homosexual lifestyle because God is love. It now means, if we don’t accept the homosexual lifestyle, then we are not doing what God wants, because we are hate mongers, this is a Biblical perversion. The same John who wrote the above verse is the same John, who in the same letter, gave the believer a rock solid way of knowing if we are Biblical in our love when it comes to the issue of homosexuality or any other issue. This is how a believer can know if they truly love God. And this is the rock solid measure to know if we love our fellow-man. As Christians we must obey God’s word which leads to righteousness, if we want to say we love God. In today’s society, the hot issue isn’t if we love God, but if we love and accept homosexuality as normal and acceptable lifestyle for an enlightened (false) Christianity. We are being wrongly told this is Christian love of our fellow-man. Scripture is clear, if we love our fellow-man it can only be shown when we love God (which is only manifest when we keep His commandments), and keeping His commandments. I am 49 now and for a long time I have heard that the church is going to have a line drawn in the sand. When this line comes Christians will have to decide whom they serve. I would never have thought it would be whether we follow the Word or not. I would never have imagined it would boil down to if we as believers want to have godly offspring. ← Did Jesus say that He lost none that believe on Him?